Pierce each potato a few times with a knife, place in a microwave-safe dish and loosely cover with plastic wrap. Microwave on high 5 to 6 minutes or until potatoes are fork-tender. Microwave green beans according to package directions. Heat a grill pan over medium-high heat. Coat with cooking spray or line with foil; season steak with salt and pepper and cook 2 to 3 minutes a side or until desired degree of doneness. Transfer to a cutting board to rest. While steak is cooking, combine miso, vinegar, ginger, sugar and sesame oil in a small bowl. Whisk in vegetable oil. Cut potatoes in half, then cut steak into 1/4-inch slices. Divide potatoes, steak and beans among four plates; drizzle with dressing. 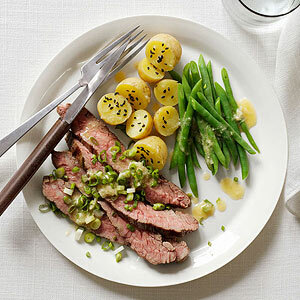 Sprinkle scallions over steak and sesame seeds over potatoes, if desired. PER SERVING: 360 cal., 16 g total fat (4 g sat. fat), 404 mg sodium, 27 g carb. (5 g fiber), 26 g pro.